This video lesson covers venir (to come). 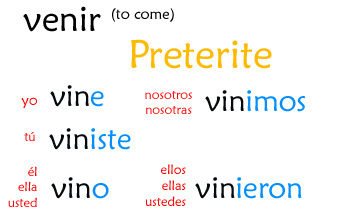 Venir is of course another irregular verb in the preterite. In this video, I also mention that whenever a verb has any irregular inside of it due to a prefix, the verb follow the pattern of the irregular. Nadie vino a la classe de biologio. Why is there “a la” in the sentence? Im guessing it would be similiar to… “to go” example…. Ellos van a la tienda…. ‘a’ is often used in reference to motion… as in… to go to or to come to a place. In this case, “no one came TO the biology class” that’s why the “a” is needed. El ejemplo…no one came to biology class. Why was.. nadie vino a la clase de biologia, instead of…nadie vinieron a la clase de biologia? Isn´t nobody came to the class, the same as they all didn´t come to the class? “Nadie” is a singular word so takes the singular form of the verb. Vino.